You can do this recipe 100% in your kitchen and without a grill. Just insert the word “oven” or "stove top" every time you see “grill”. Sure you'll lose out on the smoky flavor but it's more than that. You are missing out on the experience of cooking out doors while the sun is setting, the cicadas are singing their summer song, and all of your neighbors are outside soaking up life. 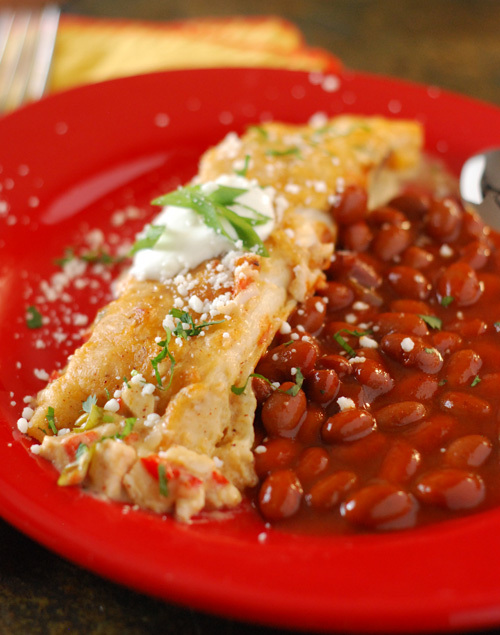 We served these with the Texas Ranchero style of Bush's Grillin' Beans, a perfect match. Earlier this year I did a sponsored post with Bush's and I had to do the standard “FTC disclaimer”. Well that was over months ago and now I can say freely, I love Bush's Grillin' Beans, no disclaimer required. They really are my favorite beans. Heat a skillet over medium-high heat and add 2 Tbsp of butter. Saute the red and yellow onion, bell pepper, and chilies for 5 minutes or until tender. NOTE: I used a blend of mild and medium heat chilies from my local farmers market. 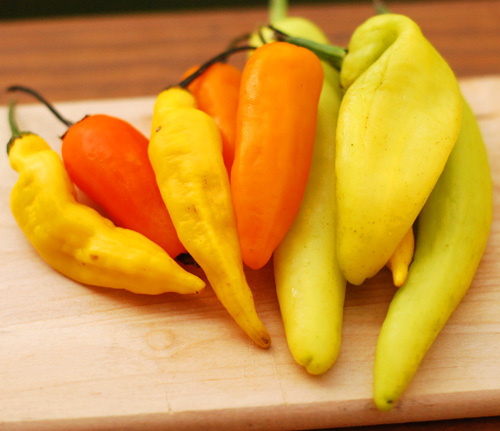 Use a blend of chilies that suits the heat level you like. If it is offseason, you can use a 4 ounce can of green chilies. You'll need twice the amount to get the same flavor of fresh. Add the garlic and cook for another minute. Take off heat and let cool for another minute. 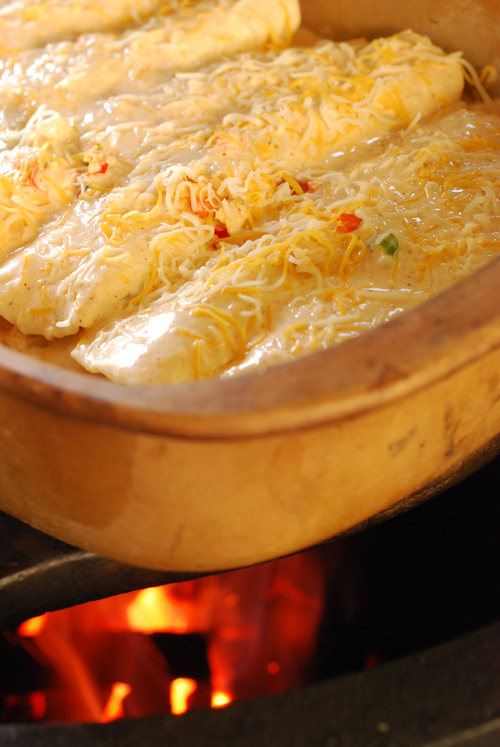 In a large bowl, add the veggie mixture, chicken, green onion, cilantro and ½ cup Monterrey jack cheese. This will the filling for your enchiladas. Using the same skillet from before, add and melt the 3 Tbsp butter. Whisk together with the flour for 3-4 minutes, stirring constantly. Be careful not to let it burn. Slowly add the chicken broth, whisking until blended. Bring to a simmer. Remove from heat and add the spices and manchego cheese, whisk until blended. You might have carpal tunnel syndrome by now. Quit whining and keep whisking. Now add the sour cream and....yes, whisk until blended. 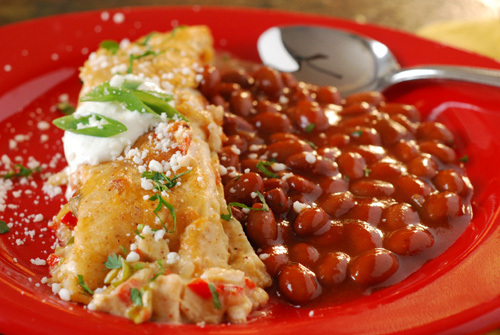 Add ½ cup of this enchilada sauce to the filling and toss to coat. 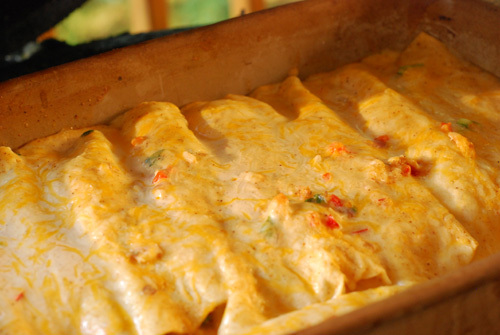 Take a tortilla and dip in the rest of the enchilada sauce. Top with about 1/3rd cup of the filling. Roll up and place seam side down in a 9 x 13” stoneware. Repeat until you have all the enchiladas rolled. Ladle the remaining sauce over the enchiladas and scrape any goodies left in the filling bowl on top. Sprinkle with the last of the cheese. Fire roast the dish over indirect heat for 35 minutes, uncovered. TIP FOR BIG GREEN EGG folks: The plate setter does provide indirect cooking but if you put a pan directly on it, you will have conductive AND convective heat so the bottom gets hotter, quicker. 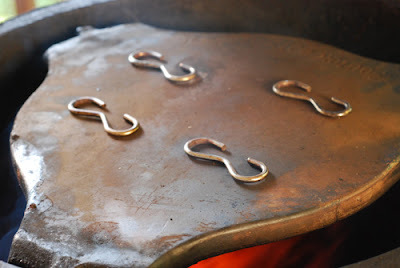 Use some kind of spacer between the plate setter and pan to minimize the conductive heat. I just use some stainless chain links. Egg "feet" work great too. It is done when it is all melted together, bubbling, and the exposed edges of the tortilla are starting to turn crispy brown. Garnish with sour cream, green onion, and cotija cheese. No compensation was received for this post from any mentioned companies, brands, or varieties.